NEW YORK (CNNMoney.com) -- Unemployed workers of America Unite! That's what the long-term jobless -- branding themselves "the 99ers" -- are doing to raise awareness of their plight. Grassroots activist groups are springing up around the nation to petition lawmakers to extend unemployment benefits beyond the 99-week limit and to do more to create jobs. The jobless are conducting letter-writing campaigns and holding rallies. The goal: Give a voice to the unemployed. "It made sense that we all join together so when we contact elected officials, they know it's not just 20 people or 200 people, it's thousands and thousands and thousands of people," said Gregg Rosen, co-founder of The American 99ers Union, an alliance of 19 organizations. Roughly 14.8 million Americans are unemployed, with about 6.2 million of them out of work for at least 27 weeks. About 8.5 million people are collecting unemployment insurance. But as the nation's economic funk grinds on, a growing number of the jobless are exhausting their benefits. Precise numbers are hard to come by, but estimates show that about 3.5 million people have fallen off the rolls, though some of them have landed work. That's why advocates are pressing Congress to add another tier of unemployment benefits. The additional weeks will cover the jobless, while giving the economy more time to recover and create employment opportunities, they argue. There is little appetite in Congress, however, to extend benefits beyond the current 99-week maximum. A bill that would have added 20 weeks went nowhere this fall. That is not deterring the activists. The American 99ers Union, for instance, sent 10,000 letters to lawmakers earlier this month. The petitioners are arguing that the additional benefits will be spent quickly, which creates jobs and stimulates the economy. Other groups are taking a more high-profile approach. FlashMobs4Jobs is holding rallies and demonstrations, mainly in New York City, to show how urgent the need is to extend the safety net. "We want to educate and ask for support from the American public so they understand these are not lazy bums happy to get a check," said Kian Frederick, an unemployed union organizer who founded the movement. 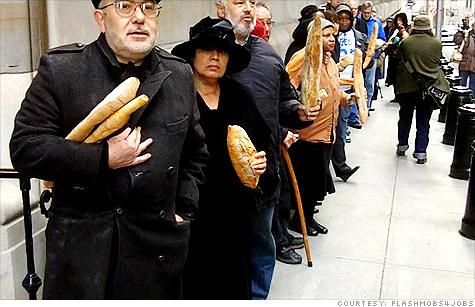 Earlier this month, the group recreated a 1930s breadline outside the Federal Reserve Bank of New York to send home the message that many jobless are finding it hard to feed themselves or their families. At one recent rally, four demonstrators got themselves arrested for civil disobedience "to call attention to the seriousness of this," Frederick said. The activist groups also serve as a support network for the unemployed, who often find themselves isolated. UnemployedStatesofAmerica provides forums for its 270 members to ask questions, post information or just vent. It also offers resources such as interviewing tips and the number for the national suicide prevention hotline. And it sponsors an online radio show focused on unemployment issues. "This gives them a sense of 'people are going through this with me. I am not alone,' " said Wendy Ashley of Evansville, Ind., an unemployed factory worker who spearheads the site.